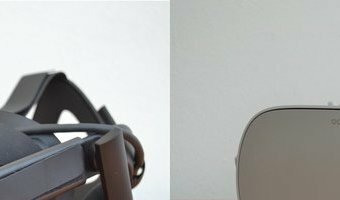 Oculus Rift S vs Oculus Quest vs Oculus Go vs Samsung Gear VR: What’s the difference? There are now a few different choices for those looking to get into virtual reality with a number of VR headsets available at varying prices.At one end of the spectrum that are headsets that use compatible mobile devices for their VR content while at the other end sits the high-end devices that require a powerful gaming computer to run. Oculus offers several different VR headsets including the Oculus Go, the Oculus Quest, the Oculus Rift and the flagship Oculus Rift S.The Oculus Rift was the company's flagship VR device, but that's now being replaced by the Oculus Rift S. This is a powerful virtual reality headset that needs a PC to run, while some of the other devices offer a wire-free VR experience. But what's the difference between them? We've got all the info you need to know. Design features Samsung Gear VR: 207mm x 120mm x 99 mm weighing 345g, 64GB onboard storage and MicroSD slot Oculus Go: 190mm x 105mm x 115mm weighing 467g, 32GB or 64GB … [Read more...] about Oculus Rift S vs Oculus Quest vs Oculus Go vs Samsung Gear VR: What’s the difference? Oculus Quest vs Oculus Go vs Samsung Gear VR vs Oculus Rift: What’s the difference? There are now a few different choices for those looking to get into virtual reality with a number of VR headsets available at varying prices.At one end of the spectrum that are headsets that use compatible mobile devices for their VR content while at the other end sits the high-end devices that require a powerful gaming computer to run. Oculus offer several different VR headsets including the Oculus Go, the Oculus powered Samsung Gear VR, the new Oculus Quest and the Oculus Rift. The Oculus Rift is currently the company's flagship device that needs a PC to run, while the other devices offer a wire-free VR experience. But what's the difference between these devices? We've got all the info you need to know. Design features Samsung Gear VR: 207mm x 120mm x 99 mm weighing 345g, 64GB onboard storage and MicroSD slot Oculus Go: 190mm x 105mm x 115mm weighing 467g, 32GB or 64GB storage Oculus Quest: details yet to be announced Oculus Rift: 391mm x 165mm … [Read more...] about Oculus Quest vs Oculus Go vs Samsung Gear VR vs Oculus Rift: What’s the difference? An iPhone X for $5 per month? Yep! Just a few weeks ago, Sprint unveiled a pretty tempting (and short-lived) offer on the iPhone 8: $8 per month when you sign up for a Sprint Flex plan.Today, the carrier has a similar deal lined up for Apple's best phone (for now): The iPhone X for $5 per month. Once again, that's with an 18-month Sprint Flex plan -- but there's a second requirement as well: an eligible trade-in.See it at SprintWhat phones are eligible? In a rather frustrating move, Sprint doesn't provide a list -- you just have to work your way through the phone- and plan-selection pages, then enter details about your phone to see if it qualifies.Thankfully, I've got the list right here: Apple iPhone 6, 6+, 6S, 6S+, 7, 7+, 8, 8+, SE, X, Asus Zenfone AR, Essential Phone, Google Pixel, XL, 2, 2XL, HTC 10, U11, LG G5, G6, Stylo 3, 3+, 4, v20, v30, v30+, Motorola Moto E Plus 5, E5 Play, g6, X4, Z, Z Droid, Force Droid, Z Play, Z2 Force, Z2 Play, Z3 Play, Samsung Galaxy A8+, J7, J7 Perx, Jy Prime, J7 Refine, Note 5, Note 8, … [Read more...] about An iPhone X for $5 per month? Yep!